Time for another great recipe for a prank guys!! all you need is.... 1.A sleeping friend... 2.Tons of powder! 3.Fake blood... 4.Candles...but don't light them! 5.A comfy couch! 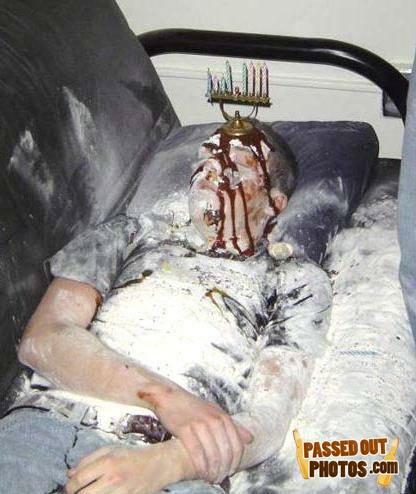 Now,put your friend on the couch and then spread the powder all over him/her!then,pour the fake blood on his head...and then to top it all over,put the candles on his/her head!when he/she wakes up,they will be up for a BIG surprise! DONT MESS WITH THE RABBI!!!! seriously dont! Faire un gâteau étant somnambule, c'est pas facile!!!! Some people think Ebenezer Scrooge is....Well, he's not, but guess who is: All Three Stooges! Stupid frenchie learn to write english like every normal person. I dont write german on non-german pages, either!!! Oy gevalt, some meshugas has been hitting the Manischewitz too hard, nu?